Shoes for plantar fasciitis - Learn the best and worst options here. As podiatrists, a very common question we are asked is “what are the best shoes for plantar fasciitis?”. We will talk about shoe selection in a moment but understanding why plantar fasciitis occurs is the first step in understanding what features to look for in a shoe. The plantar fascia is a strap that tethers the front of the foot to the back. It is essential in holding up the arch of the foot. If it were cut, the foot would deform well out of shape and lie flat on the ground without any arch at all. As we walk and the foot spreads out, there is an elongation tension applied. We would call this becoming weight bearing or “loaded”. Plantar fasciitis occurs due to excessive and repetitive loading of this band. This can occur during extreme forces such as a single time landing from a jump from a good height. It more often happens during day to day activities such as walking and running. By supporting this band with footwear, the strain on the plantar fascia can be reduced. How the best shoes for plantar fasciitis can affect your gait. The maximum elongation or “peak load” on the band occurs when you begin to lift the heel from the ground during each step. The first centimetre or so of the lift is the most physically challenging for the plantar fascia. By wearing a shoe with a small (8-12mm) elevation to the heel, this hardest phase can be avoided all together. Therefore, choosing a shoe with an adequate heel height is an important consideration when choosing shoes, not only for exercise, but also for day to day activity. Flat shoes, such as fashion sneakers, plain thongs, slippers and ballet flats are a bad choice if you suffer from plantar fasciitis. The second most critical time in each step is when the forefoot hits the ground. At this time, the fascia has to go from being slack to being taut. The ‘yank’ (peak force) applied by bearing weight is reduced if this loading of the band can be spread out over a longer time. To best manage this force, we need to consider the density of the shoe. In general a softer, more cushioned shoe is better than a hard shoe in slowing down the speed of the plantar fascia elongation. Shoes that are really soft – can in fact be too soft. 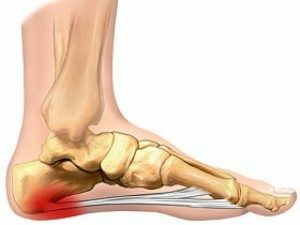 To be good shoes for plantar fasciitis, the sole needs to deform, but with resistance. This allows the shoe to effectively slow the elongation of the plantar fascia band. People with sore heels very often come in to their appointment with a very soft memory foam style sole. These seem like a good choice in the shop but they are not ideal. In shoes for plantar fasciitis, another good feature to look for, especially for sports, is a dual density midsole. This is a denser area under the inside ankle bone and is commonly found in good brands of joggers. It changes the dynamics of the foot to create a soft touch down on the outside of the heel and firmer resistance on the inside to help hold the heel in a more vertical position, slow the band elongation and to support an orthotic device. Even if you do not currently wear orthotics at the moment, if you have plantar fasciitis, it doesn’t hurt to plan ahead in case orthotics are required to treat your pain. What brands of shoes for plantar fasciitis are the best? Generally good brands of casual shoes include Vionic, Keens, Revere, Zierra, Orthaheel, Naot and Merrell. We suggest avoiding the use of all very flat shoes. This includes ballet flats, house slippers, standard thongs and ‘barefoot running shoes’. They are too flat and provide no support for the plantar fascia which increases the strain on the band. at the point of heel lift. This is so important that if all other things were equal, a hard shoe with a 12mm heel raise would be a better choice than a soft, super flat style of shoe. Keep a pair of shoes with an adequate heel height and some arch support beside the bed to reduce the pain of the first few steps on rising. Orthotics Vs Shoes for plantar fasciitis. Whilst getting the right shoe is important, you may need to consider orthotics to treat the condition. Orthotics can effectively turn nearly every shoe into a ‘good’ shoe. Therefore can be cheaper (as well as more effective) than buying a whole collection of ‘orthopaedic’ type supportive shoes.